Clothes I – KonMari | ___is black the new black? Before I began this KonMari adventure, I had just purged 4 supermarket-sized reusable bags. 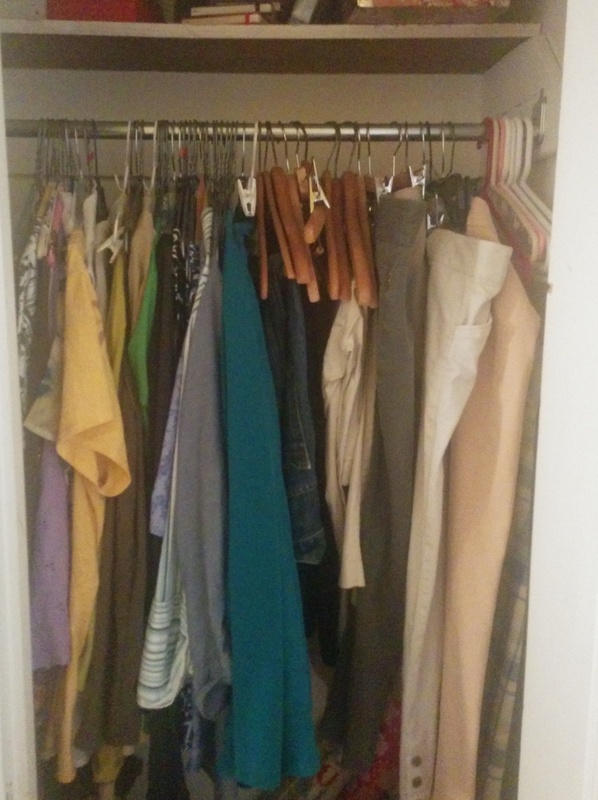 Although the clothes in my dressers were mostly in a state of chaos, and even though my three closets were packed, it was all pretty organized. Although clothes are hard for me to purge, I do go through them pretty regularly. Reader, I brought five contractor-sized plastic bags to the thrift store. One more will leave the house with the trash on Friday. That makes six bags of clothes I got rid of. 3 bedroom closets, 1 coat closet, and 2 dressers. Everything crammed to the gills. Let’s look at the before. I will spare you pics of the coat closet of doom. There’s not much in the way of clothing, but it’s filled to the brim with holiday decorations, my comic book collection, luggage and a bunch of mystery items. 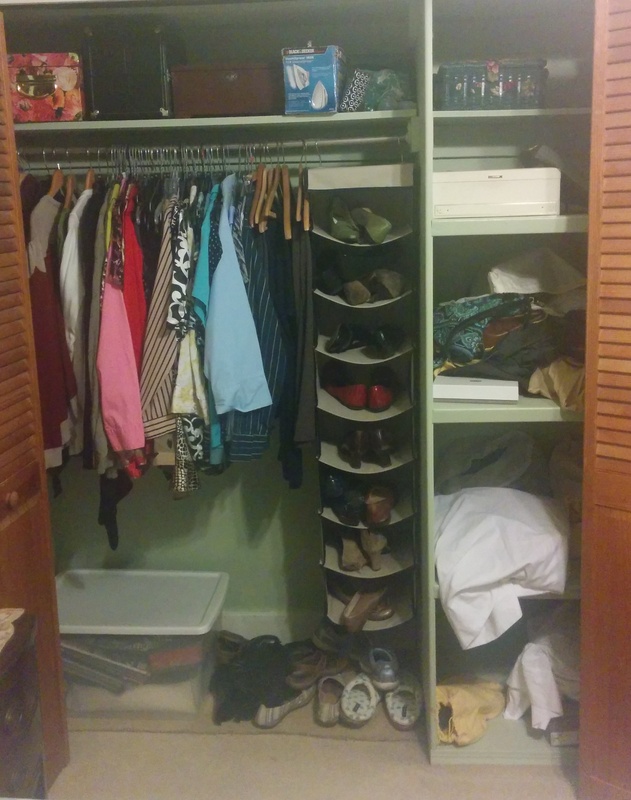 The other closets were jammed, but largely functional. One had work clothes. The other had casual clothes, and the third held my dresses, jackets, and the clothes either too big or too small for me. The one dresser was crammed to the gills with shorts and t-shirts, sweaters, and workout stuff. The other dresser was pretty good. A few years ago, I’d tackled the underwear and socks, and if nothing was folded with the Marie Kondo seal of approval, I could at least find stuff. 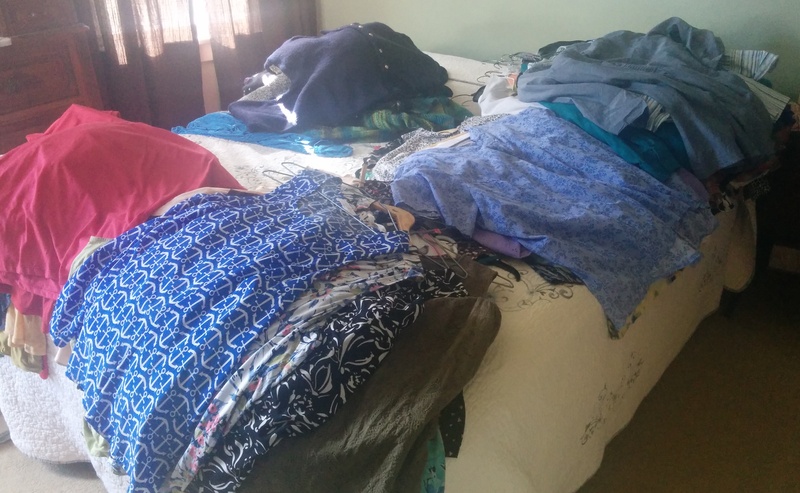 I began with tops, pictured below, loosely categorized because I hate, hate, hate ironing and I didn’t want to destroy the stuff that required that. You should know that I am not a clotheshorse, by any means. What quickly became apparent, other than my strong love of black cardigans and black sleeveless shirts, was that not only did I have far more than I ever realized, I was “meh” about a vast majority of it. 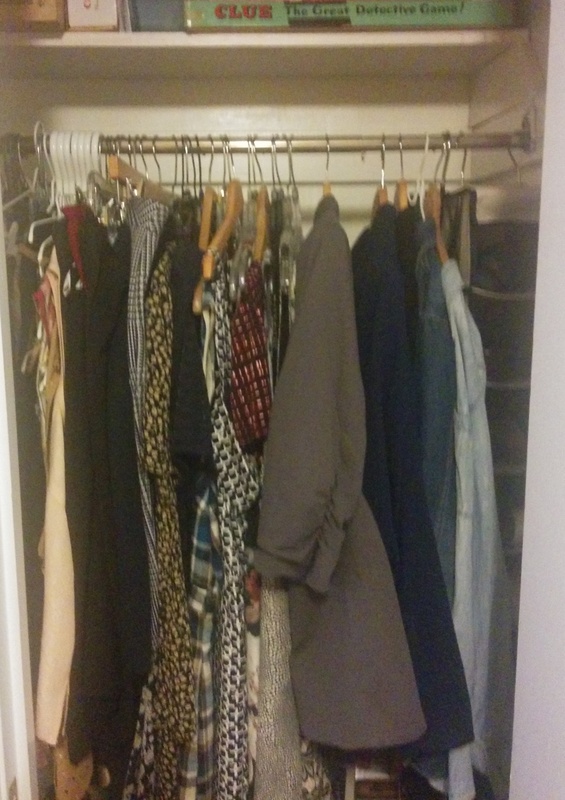 According to a closet expert that The Wall Street Journal interviewed, most people only wear 20% of their wardrobe. Based on what I kept, I can believe it. I’ve seen some of Kondo’s critics point out that her book and her ideas come from a place of privilege, and while I get that—not everyone can afford to replace stuff—I’ve been poor and there can be a sense of false economy that creeps into your life when you don’t have much money. For instance, you buy 5 t-shirts dirt cheap from a big box store because you can’t afford to go to a department store or some place a bit higher end. They’re low quality t-shirts and they wear out pretty quickly. And then before you know it, you’re back at the big box store buying another 5 t-shirts, when really you probably could have bought 1 or 2 slightly more expensive, higher quality ones that you wouldn’t need to replace. Okay, enough with the social commentary. Although my sort of tops was pretty quick, and I did actually try thanking every item, it got a bit chaotic after that, because with each new category, my bed got piled higher and higher. Also I failed to anticipate the hanger chaos. I would show you photos, but by the time I was there, I was so into the process I forgot to do that. There may have been some swearing. A sweater that I meant to keep because it truly did spark joy got destroyed when I got it tangled in with the hangers and could not get it out unscathed. The process of deciding what I loved and what could be purged was surprisingly easy. It got pretty addictive pretty fast. I had to slow down to acknowledge internally why I was letting stuff go. I’m glad I did too. I’ll have photos of my newly ordered wardrobe situation tomorrow. Pingback: Clothes II – Konmari | ___is black the new black?